In need of a snack, starter or side dish? Make the prawn paste by blitzing the prawns, salt, soy, sesame oil, spring onions, ginger, and egg together to make a thick paste. Cut each slice of bread into 3 rectangles. Then spread the prawn paste generously on one side. Put the sesame seeds on a plate and then press the prawn paste side into the seeds. Heat the oil over a medium heat and fry the toast paste side down first for 2/3 minutes and then turn and cook the other side until the bread is golden brown. 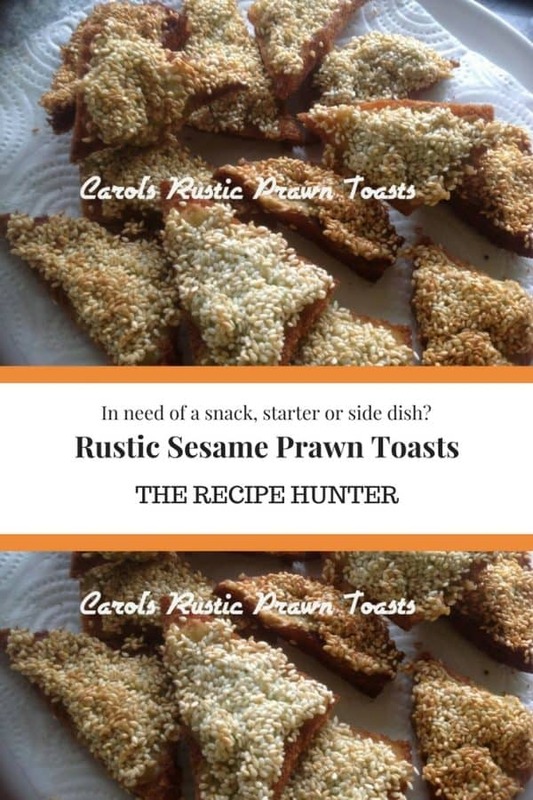 MY toasts look a bit rustic as I don’t think I pressed them down hard enough in the sesame seed and my fat was a little too hot, however, they did taste good, hence the title rustic prawn toasts.